A cover-to-cover redesign of Bates Magazine debuted in June 2012, prompting dozens of reader reactions from Bates alumni, parents, faculty, staff and friends. Below are those comments, all are by email unless otherwise noted. The cover of the Spring 2012 issue of redesigned Bates Magazine features President Clayton Spencer, who took office July 1. 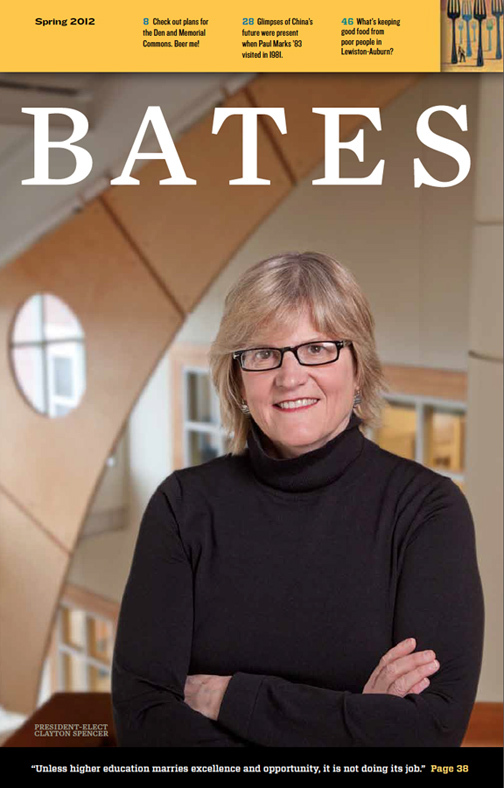 As a former associate publisher of a trade magazine, I was very impressed with the new design for the Bates Magazine. It was fun to read, colorful, informative and sleekly modern in its “sound bites” format. Really fine! We’re on the beach in Florida reading Bates Magazine. It is fantastic. Great, great, great magazine, best I’ve ever seen. Kudos to everyone involved. Love the feel and hope it continues. Re-engages alumni with the changing sociocultural context of Lewiston-Auburn. The content fosters a community of engaged readers among alumni, faculty, staff, and students, each learning something new about the other college constituencies. I can take it with me anywhere! And I share it frequently! I think the redesign is better than what the University of Chicago did this past year with its alumni magazine! A quick note to congratulate you on the excellence of the latest copy of Bates Magazine. The graphics, the stories, and the general information are outstanding. The format will make me keep it for a long time. I live in Williamstown, Mass. It is Clayton Spencer’s alma mater’s town. My pals gave me tons of congratulations, and I asked the to the effect of what the hell is this about? It was about Bates’ new president, who many them know. I favor sports and the military and the stories were impressive, to say the least. Keep up the good work; it brought back lots of good memories. OMG, the little feature [in Amusements section] of Lola is amazing! Thank you so much for including her in the newly designed magazine (it looks great) and sending me an extra copy. Absolutely loved it. In fact, I plan to frame it. I really enjoyed reading the latest issue cover to cover. The mix of what is going on at Bates, what students are researching and news from alumni definitely appeals to me. Thanks for the change! The section on Lewiston is a great addition (and in this issue particularly mouth-watering.) BCDC has been working in partnership with the Harward Center to reach out to the Lewiston business community on some new initiatives, and this section reinforces Bates’ organizational commitment to the community. I can imagine it was no small feat to prepare the first issue, and I wanted to congratulate you on the launch. It’s a very exciting time to be at Bates, and the magazine captures it handsomely! It looks terrific — nice design and very with it. Great job, Jay. I am not sure if you knew this but I am now a Washington state resident, where the mountains meet the sea. My Bates Magazine just arrived and I wanted to let you know I love the change. For me, especially now that I am away from Maine, it was more nostalgic. I found myself smiling and reminiscing more than I ever have in the past. Well done! I just wanted to make sure you knew how nice it is to have the magazine to keep the visual and emotional tie with the campus. Just wanted to say that I am most impressed with the new look of Bates Magazine. Brilliant. Just got New format Bates Magazine. Curious as to rationale for the narrow format – just part of the “hip” look? I must not be into “hip”! I miss the glossy finish — it suffers by comparison with the Harvard mag I got at about the same time. “Hip” look again? Content looks good though, hang in there. WOW! We love the new magazine. We have reached the modern world and find it so attractive. Great Job! Wow. You have created something absolutely remarkable — a real sit-up-and-take-notice publication that is as delicious to look at as it is to consume. Congratulations. Talk about going from zero to warp speed! You have taken us somewhere we have been waiting to go, and announced to the world that Bates is fresh, innovative, compelling, surprising, diverse and, most importantly, joyful. I absolutely love the new magazine. Champagne all around! The magazine looks awesome! Nice job! Despite all hell breaking loose over here due to the final week’s full court press to get to 50%, I couldn’t let any more time pass before I wrote to say how incredibly thrilled I am with the new magazine! It is nothing short of amazing. It gives me chills just to think about it. You really worked magic! I am almost speechless it is so special and truly outstanding! You are going to receive tremendous accolades, and they are going to 100% deserved. Looks great! I was reading it on the beach on Martha’s Vineyard this past weekend with fellow class of ’78ers Deni Auclair and Susan Hannon. We all agreed it’s a positive change. An outstanding job! As an enthusiastic alum (and a long, long-retired IBM Manager of Graphic Design), I “happily pronounce” the new number as intelligent, inviting and a joy to both read and behold. A encore may well present a challenge, but the timing for Clayton Spencer’s arrival is exquisite. Heartiest congratulations. Just wanted to say that the new Bates Magazine is great. Just read it. Great design, and content is wonderful. Think Clayton’s profile was spot on. Authentic. Real. A very positive first impression. It is a perfect garden for the summer and I bet will be very well received. Congrats to you all. I really like the size and feel of it, and the new design overall. Very cool! I’m glad to hear there have been lots of positive comments. Even my husband, who is not affiliated with Bates, commented when he saw it sitting around the house. He really liked the look and feel, too. The newly redesigned magazine is BEAUTIFUL — I haven’t had a chance to read through it all yet, but I’m tremendously impressed by what I’ve seen. I’m sure it took a great deal of time and effort to put this together, so kudos to everyone involved in this delightful work — I look forward to all future issues! I find the new and improved Bates Magazine a disappointment. Just because you can play with formatting and photographs does not mean it is always a good idea to do so. A two-page spread of students lying down on the grass seems to miss the Bates ethos of hard work and purpose, for example. Likewise, photos of kids who jumped into the puddle in the middle of the winter. Fun is not what the Bates brand is supposed to be known for. I found it hard to keep the magazine open when I was flipping through the pages unlike in the old format. It seems designed more like an object to be put on the coffee table rather than a text to be read. Short articles with narrow columns and small print don’t look as if they are going to appeal to older alumni with weakening eyesight. Your serious articles are still there but seem buried in lots of infotainment. The columns in the back with news for the different classes are in very narrow columns in small print. I read the magazine online in the flip edition, which was a lot more readable. I understand you must experiment in order to reach different audiences while keeping the one you have. One should always look for ways to bring in new readers. But I think you need to tinker again with the formula because this new version does not say Bates. What a great redesign of the magazine! Stunning. Absolutely attractive and inspiring! Great work. Proud to be a Bobcat! The magazine is Bobcat great. But the print is too small for my tired eyes. It needs to be much bigger. I missed a lot cause I couldn’t read it. Can you make the print BIGGER? I just received my newly redesigned Bates Magazine in the mail today. It was a pleasure to read; a great format to advertise our school and share information about Bates with current students, faculty and alumni. Congratulations on a job well done. Also, I was so pleased to read the obituary for my mother Phyllis Simon Albright ’48. I had been meaning to send in a notice of her passing, but never got around to it. Please thank whoever was kind enough to write that very nice article. I really appreciate it. I didn’t even know she was secretary of the Hudson-Mohawk Bates Club, nor did I know she was a member of Future Teachers of America while at Bates! Thank you very much! WOW! You really did it! Very exciting — a page turner — again and again. The new Bates Magazine is great, including the photos. I especially appreciated the aerial photo in the back because it’s always been difficult to visualize where the new buildings mentioned are without a map. I’d met Clayton Spencer in San Francisco in April so of course enjoyed reading about her. And I’d been seeing several mentions of the Peter Gomes Chapel but never an explanation. Nice to have one at last. The only downer was that it arrived in my mailbox on the afternoon of June 29, which to me to really hampers what I took to be its (at least partial) goal of inspiring readers to send money by June 30. I could just hear people thinking, “Oh, well, too late to send a check this year. Maybe I’ll get around to it next year.” I’m sure you didn’t plan it that way, and the untimely arrival was due to production problems, with which I’m all too familiar. I liked the suggestion to pass my copy along, and may give it to my local high school’s counselor. But I hesitate because of all the contact information in the alumni notes section. I may just cut that part out. I like your new format, content and even the feel of the paper! More importantly, the magazine’s willingness to try a different look. Thanks for a great article on the China of 30 years ago in the recent Bates Magazine. I especially enjoyed reading about the difference that this experience made on Paul Marks; I was actually hoping to read more about him. I thought the new Bates magazine presented [Clayton Spencer] very well, and I thought the magazine itself is beautifully done. I don’t dwell much on redesigns, but this one is really excellent. Wow, is that ever cool. makes me feel like I went to RISD, not bates. nice work. but I am concerned about your ability to sustain the granularity of it. there’s a lot of entry points in there! I recommend adderal. I just wanted to offer kudos on the new magazine! It is really wonderful! You have packed so much interesting, relevant, engaging information in but in such a way that it is still easily read and absorbed. I’m sure this was a huge effort by a large team of folks in BCO and the results are exceptional. Congratulations! You have indeed hit a home run with the most recent Bates Magazine, and I am writing to convey my sincere congratulations to you and your team. As a college professor teaching traditional age students; the new size, the format, and the tight editing are right on target. I know this will be well received by the younger generations, and as a member of the class of 1956 … that includes just about everyone. You did it! The spring 2012 edition is a beauty. I love the feel of the paper, the vast variety of material you cover, the many clear bright pictures. Plus, of course, my letter and photo and your commentary on page 2! Many thanks. I’m sure you’re sleep deprived from all the extra time you put into this transformation. It’s a grand success. For lunch today I went over to Commons, and while I was there two staff members spontaneously went out of their way to deliver strong praise (and nothing but) for the new magazine. It was the first thing each wanted to talk to me about. One was Holly Gurney. The other was Bob Leighton. Both were totally enthusiastic and very congratulatory. They had no criticisms whatsoever. So hip! So happenin’! smells like soy ink. so green. shape of National Geographic. Can’t wait to peruse. Congratulations! Great changes to the Bates Magazine, it looks incredible and I love the new format. Nice work with the magazine! You really meant it when you said that the magazine has a new look. LOVE IT!! Congrats to all. Jay, I love the new layout. I actually took it home and read it pretty much cover-to-cover. I’ve passed it along to a friend who is always interested in Bates because I thought he would enjoy reading the article on incoming president. Previously I would scan and read some of it. My only comments is that the font size in some areas is pretty small and for our older alums it may prove quite challenging. The new size differentiates the magazine from other “standard” publications in my household. As such, it’s easier for me to find it — on the coffee table, bed side table, etc. — in and amongst other magazines. The new magazine seems more substantive in terms of amount, variety, and relevance (to our target audience) of content. If the magazine is perceived to be more substantive, an individual copy is likely to “stick around” longer in an alum’s household, thus encouraging repeat and/or additional readings by the alum/others in the household. Terrific aerial shot of Bates on the back inside cover! Alums will certainly see buildings and structures familiar to them, as well as some new / updated ones. Great job, Jay! I thoroughly enjoyed reading the new magazine. Thank you. I really like (love?) the new format. You (and your colleagues) did a magnificent job with this project. I especially like the quote at the bottom of the cover… it drew (pulled) me right into the magazine! Not that I wasn’t already anxious to dive in, but if there *had* been a hesitation, that quote did the trick! Congratulations on a job well done! It is AMAZING. Well done. WOWEEE! great balance of fun department/ columns and college editorials…. and whew, looks like a lot of dedicated work! I just got my magazine yesterday at home and I think it’s wonderful. Never have I enjoyed the Bates Magazine as I did this last issue. My check is enclosed to show my support of this terrific publication. Normally it sits by my chair in the “get to” stack, I read a bit, put it down and return days or months later, but not this time! I sat down and two hours later finished every word. Even class notes from other classes! Thank you for a worthwhile publication that I look forward to reading again! P.S. I could write lots more — like I loved the obit on Ruth Wilson, back cover, first 23 pages- not sure how that can stay fresh…and I’ve already shared with this local library. Plus — I hope to utilize the look in any newsletter I’m tasked with again! Thanks!